The genuine and honest galloper Wonder Woman (pictured) has a tough assignment ahead as she looks to take on a strong assembly of three-year-olds in the Listed Mufhasa Stakes over 1300m at Ellerslie tomorrow. Despite the wide draw, co-trainers Mike Moroney and Pam Gerard are confident the filly can give some check after running some competitive races against older opposition in her last couple of outings. “She’s an out and out sprinter and this Listed race they have added is right up her alley,” Gerard said. Leading apprentice rider Sam Weatherley will continue his association with the daughter of Showcasing. 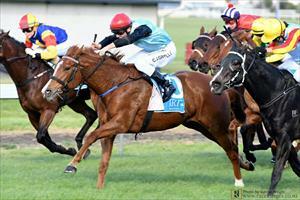 The second runner on the card will be Soul Sista who backs up from an eye catching fifth at Ellerslie last weekend. Running in the Rating 65 event for fillies and mares over 2200m, Mike and Pam are excited about the prospect of stepping her up over ground. “We’ve always thought she was capable of being a top stayer, she just hasn’t quite been strong enough to do it well, but I think she is there now,” Said Gerard. Soul Sista jumps from barrier eight and will also be ridden by Sam Weatherley.